Here at Micah Liverpool we are challenging you to complete the reverse advent calendar challenge. What is a reverse advent calendar ? I hear you ask . . . a reverse advent calendar works similarly to an advent calendar we have around this time of year but instead of receiving a chocolatey treat each day you donate an item of food a day to a foodbank. Micah has created its own reverse advent calendar which can be downloaded here by right clicking and selecting Save as. From the 1st of December the Micah staff will be taking on the reverse advent calendar challenge. 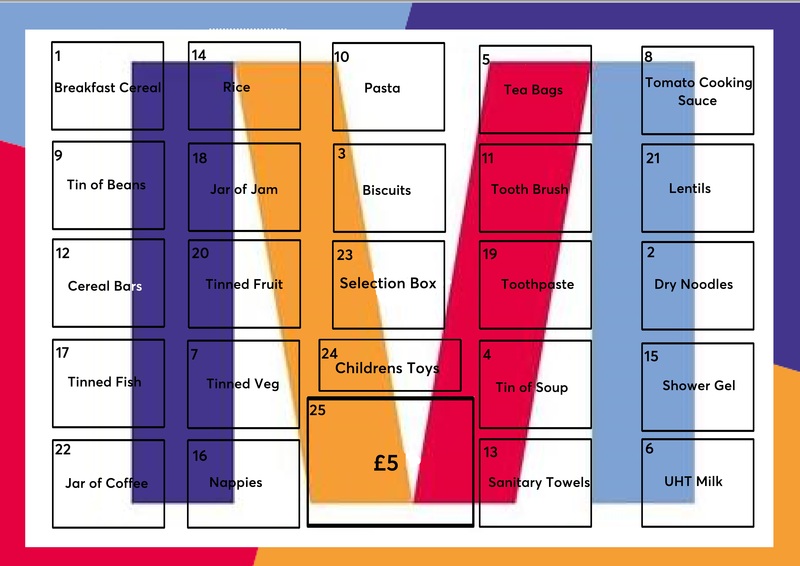 On our advent calendar we have listed the most used items in our food parcels along with a few Christmassy treats for our foodbank users this time of year. Can you, your school, your business, your congregation, your football team take on the challenge. If you decide to take on the challenge alone then feel free to bring your donation to Liverpool cathedral and drop it off at our donation point. If you are doing the challenge as a group then feel free to contact Micah Liverpool on 0151 702 7206 or via email at paul.obrien@liverpoolcathedral.org.uk to arrange a pick up for your donations.